Dexamethasone Sodium Phosphate USP is used in the treatment of conditions for which corticosteroid therapy is indicated for parenteral administration in intensive therapy or in emergencies. Its lack of mineralocortical properties makes Dexamethasone Sodium Phosphate particularly suitable for treating conditions where water retention would be a disadvantage. Status asthmaticus or bronchial asthma. Rheumatoid disorders such as rheumatoid arthritis, acute rheumatic carditis, and acute gouty arthritis. Nausea and vomiting induced by cancer chemotherapy. Cerebral oedema associated with brain tumour, craniotomy, or head injury. Dosage must be individualized according to the severity of the disease and the response of the patient. Patients should be closely observed for signs that might require dosage adjustment. 4 mg 1.M. as a single dose. Continue maintenance therapy with dexamethasone tablets. 1-6 mg/kg body weight as a single dose; or 40 mg I.V. every 2-6 hours as needed; or 20 mg I.V. as a single dose followed by continuous infusion of 3 mg/kg per day. Initially, 10 mg I.V., then 4 mg I.M. every 6 hours until symptoms subside (usually 2-4 days); then tapered over 5-7 days. Dexamethasone Sodium Phosphate injection should be given slowly or by infusion, since rapid intravenous injection of massive doses may sometimes cause cardiovascular collapse. After high-dose or prolonged therapy, withdrawal should be gradual, based on patient’s response, dose, disease being treated, and duration of therapy. Patients with systemic fungal infections. Patients with acute infections uncontrolled by appropriate antimicrobial chemotherapy. Dexamethasone Sodium Phosphate USP should not be administered prior to or immediately after prophylactic vaccination. Heart failure, recent myocardial infarction, or hypertension. Patients with diabetes mellitus, osteoporosis, renal disease, hypothyroidism, cirrhosis, diverticulitis, nonspecific ulcerative colitis, recent intestinal anastomoses, seizures, myasthenia gravis, tuberculosis, ocular herpes simplex, emotional instability, or psychotic tendencies. The elderly or children may be at increased risk of side effects. During prolonged course of conticosteroids therapy, patients should be examined regularly. Sodium intake may need to be reduced and calcium and potassium supplements may be necessary. Following long-term therapy, withdrawal of corticosteroids, including Dexamethasone Sodium Phosphate USP, may result in symptoms of the corticosteroid withdrawal syndrome including fever, myalgia, arthralgia, and malaise. Antidiabetics, including insulin, result in decreased hypoglycaemic activity. Aspirin, indomethacin, or other NSAIDs, increase risk of gastrointestinal distress. Barbiturates, phenytoin, rifampin, decrease corticosteroid effect. Cardiac glycosides, increase possibility of arrhythmia from hypokalaemia. Anticoagulants result in decreased anticoagulant activity. Co-administration with potassium-depleting diuretics, such as thiazides or furosemide, may cause excessive potassium loss. Dexamethasone Sodium Phosphate USP injection is generally administered systemically for short-term therapy and in acute conditions. Therefore, the risk of side effects is low. However, continued medical supervision of the patient during therapy and after cessation of the drug is essential. The side effects may include euphoria, insomnia, seizures, psychotic behaviour, hypertension, oedema, arrhythmias, peptic ulceration, gastrointestinal irritation, increased appetite, pancreatitis, hypokalaemia, hyperglycaemia, muscle weakness, osteoporosis, delayed wound healing, atrophy at intramuscular sites, and susceptibility to infections. Long-term therapy in children and adolescents may delay growth and maturation. 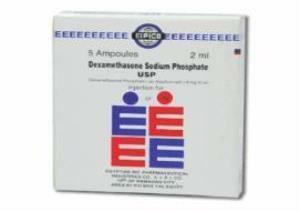 Dexamethasone Sodium Phosphate USP is a synthetic adrenocortical steroid with glucocorticoid activity. It has a rapid onset but short duration of action when compared with less soluble preparations. Consequently, it is suitable for the treatment of acute disorders responsive to adrenocortical steroid therapy. It is primarily used for its potent anti-inflammatory effects in disorders of many organ systems. Corticosteroids, including Dexamethasone Sodium Phosphate USP, may be given by intravenous injection for a rapid response; more prolonged effects are achieved by intramuscular injection. They are rapidly distributed to all body tissues. Dexamethasone sodium phosphate, and other synthetic corticosteroids, are bound weakly to plasma proteins. Only unbound portion is active. The drug is metabolized in the liver to inactive metabolites; the unchanged drug and the metabolites are primarily excreted in urine and insignificant amounts are excreted in faeces. The elimination half-life is about 36-54 hours. The slower metabolism of the synthetic corticosteroids, including dexamethasone sodium phosphate, with their lower protein-binding affinity may account for their increased potency compared with natural corticosteroids. Store at temperature not exceeding 20°C. Dexamethasone Sodium Phosphate 1 ml or 2 ml Ampoules: Boxes of 5 or 100 ampoules each.